Samsung just made the Galaxy Note 5 and Galaxy S6 Edge+ official at press events in both London and New York City. Both phones are available across the US on August 21, with pre-orders opening today. Also, AT&T, Sprint, T-Mobile, Verizon Wireless and Samsung Experience Shops at Best Buy will have previews of each phone available starting tomorrow. As expected, the phones feature big 5.7-inch QHD Super AMOLED displays, but the S6 Edge+ has curves or dual-edges on its screen. They each have 4GB RAM, Exynos 7420 octa-core processors, 16MP cameras with OIS (f/1.9), 5MP front cameras (also f/1.9), fast charging and fast wireless charging, and run Lollipop. Samsung is also launching Samsung Pay with these two devices in the US on September 28 and in Korea on August 20. 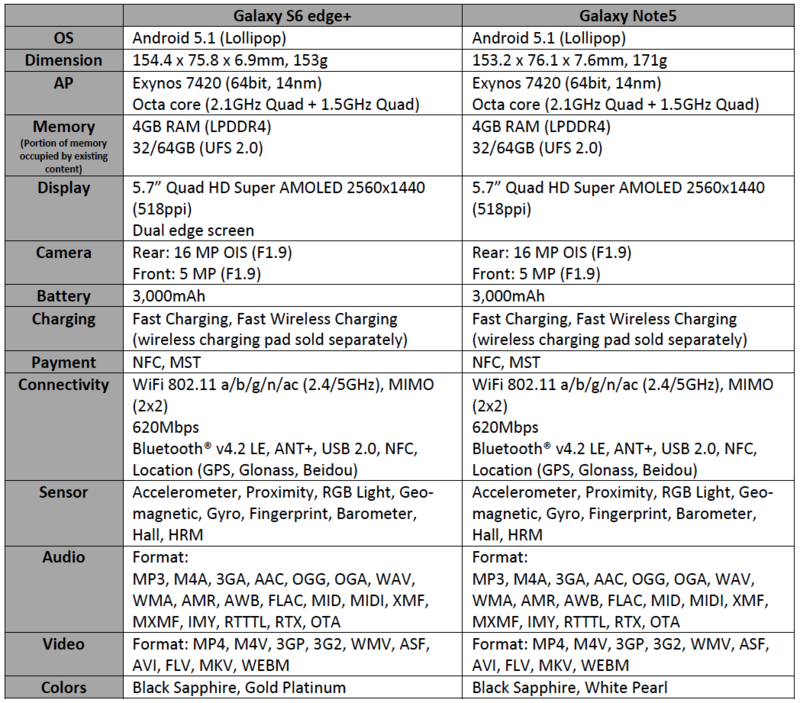 The Galaxy S6 edge+ and Galaxy Note5 blend form and function with industry leading features, including: Samsung’s best screen technology, Samsung’s most advanced camera for high quality photos and videos, fast wireless and wired charging, and an incredibly powerful processor. With increased 4GB RAM, both phones enable users to enjoy more seamless multi-tasking. With its curved 5.7-inch Quad HD Super AMOLED screen, the Galaxy S6 edge+ makes the edge experience even better and provides a more immersive multimedia experience. The thinner, slimmer and newly-designed Galaxy Note5 has a refined, next generation S Pen and multi window capabilities for a more productive smartphone experience. Samsung Pay, Samsung’s simple and safe mobile payment service, will launch in the U.S. in September and will be available virtually anywhere you can swipe your card1. Protected by Samsung KNOX, fingerprint verification and digital tokenization, Samsung Pay works with both MST (Magnetic Secure Transmission) and NFC (Near Field Communication) technologies, bringing consumers closer than ever to a world without wallets. With the Galaxy S6 edge+, Samsung is bringing everything consumers love about the S6 edge to a bigger screen in a slim and thin form factor. Beautiful and intuitive, it uses the dual edges as a shortcut from any screen to users’ top contacts and apps. ‘Apps edge’ allows users to access their favorite apps by just swiping the edge display. ‘People edge’ helps users quickly find their favorite contacts and send messages, or give a call directly from any screen. 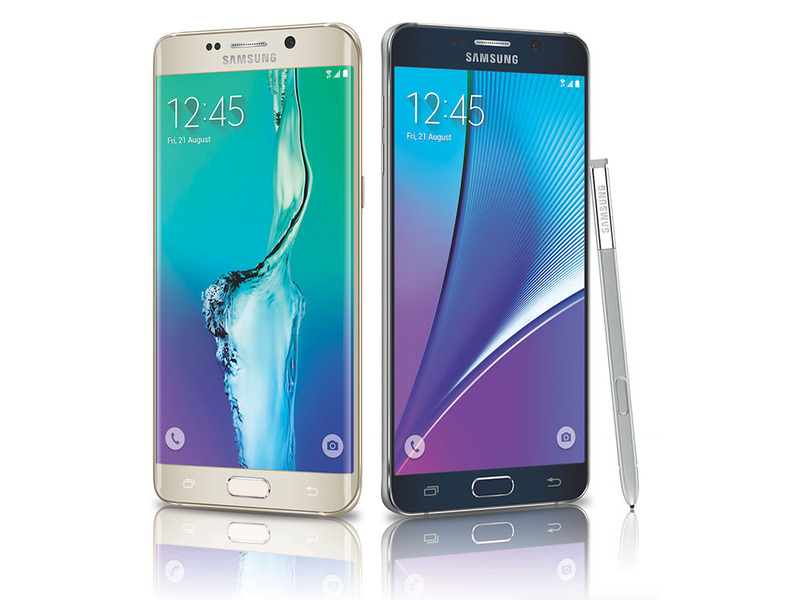 The Galaxy Note5 is a stunning upgrade to Samsung’s flagship Galaxy Note line – more powerful than ever. Inspired by the design legacy of the Galaxy S6, it ergonomically fits in one hand with a narrower bezel and curved back which makes it easier to use the phone with one hand. Engineered to help people get more done, faster, the Galaxy Note5 includes an all new S Pen that feels more solid and balanced in the user’s hand, offering improved writing capabilities and a variety of practical tools. A unique clicking mechanism pops the S Pen out with just one quick click. Users can now quickly jot down ideas or information even when the screen is off. The ‘Air Command’ feature gets more intuitive and practical as well; now the icon hovers for instant access to all of S Pen tools from any screen at any time. Users can also annotate on PDF files or capture a whole website from top to bottom with Scroll Capture. Both the Galaxy S6 edge+ and Note5 feature unprecedented multimedia capabilities through Samsung’s industry-leading 5.7-inch Quad HD Super AMOLED display. As social networking becomes more ubiquitous, consumers expect to share the moments of their lives through video. On both the front-facing and rear-facing cameras your videos will be steadier and smoother with the added Video Digital Image Stabilization. Video Collage Mode allows users to record and edit short videos easily in various frames and effects. The Galaxy S6 edge+ and Note5 also feature 4K Video filming which can be displayed on a 4K TV, as well as full HD Live Broadcast, which lets users instantly stream video straight from the phone to any individual, group of contacts, or even the public through YouTube Live. Anyone who receives the YouTube link from a Galaxy S6 edge+ or Note5 user is able to enjoy live broadcast from his or her smartphone, tablet, PC or Smart TV. Galaxy S6 edge+ and Galaxy Note5 users will also benefit from Samsung’s advanced camera system, including Quick launch (double-click the home button to launch the camera from any screen), Auto Real-time High Dynamic Range (HDR), and Optical Image Stabilization (OIS) and brand-new filters. Both devices feature Ultra High Quality Audio (UHQA) to upscale audio streams and files for richer, high-quality sound. UHQA is supported over Bluetooth on Samsung’s next generation wireless audio accessories, including the Level On Wireless Pro. Consumers can get an exclusive first look at both devices at more than 7,000 participating AT&T, Sprint, T-Mobile, Verizon Wireless and Samsung Experience Shops at Best Buy locations across the U.S. starting tomorrow, August 14. The full list of participating locations is available at www.samsung.com/onebigdecision. LIVE: Samsung Unpacked Galaxy Note 5 Event!